Ah...a photographers first wedding... It's a bit awkward, there are some fumbles, there are some kinks in logistics, there are some missed shots. Things are over-exposed and under-exposed. Photos are blurry (can we just blame autofocus?). You got carried away shooting indoors at 1600 ISO then moved outdoors and forgot to change... There's plenty of fun things you learn at your first wedding. I believe I was using my Canon 7D with an 18-55 kit lens almost the entire time. I had a Sunpak 544 manual flash mounted on a bracket - look it up. These things are beastly and when you're moving around a reception, people coming into and out of varying distances, it can be a little tricky to get lighting proper. BUT alas, we got through it and decided that shooting weddings isn't all that bad. I thought, "Perhaps this is actually the career path I have been needing to take all along...newspapers are dying...editorial is hard to come by if you don't know the right people (and I don't know the right people)...product photographers hold onto their jobs forever and ever... So it began. As my friends and colleagues began getting hitched, I began reaching out to them to shoot their weddings, slowly building my portfolio. Advertising on Craigslist didn't hurt either. Here are some photos from that first wedding. 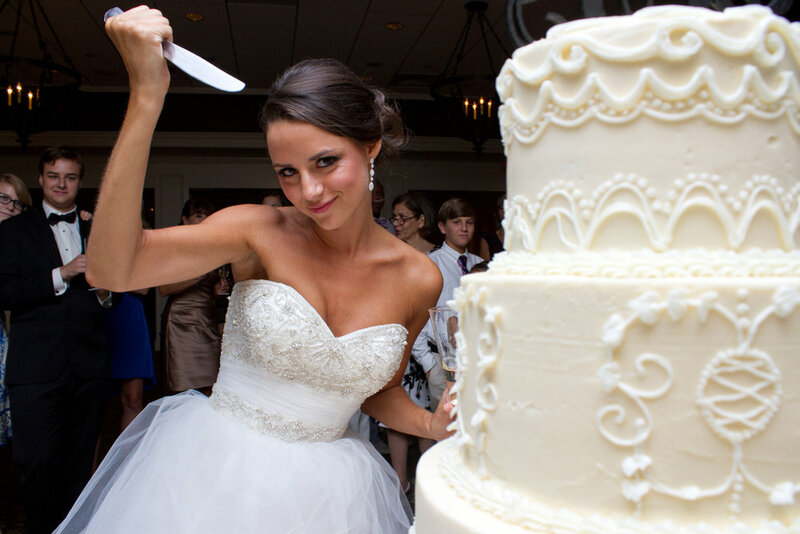 One of which (the murderous wedding cake shot) is still one of my favorites to this day. Without further adieu - Emily and Jeff's summer 2013 wedding at the Landfall Country Club in Wilmington, NC. Enjoy!